MG-450A is a borax-free ultra-high fluorescence magnetic particle premix for locating small, medium and gross discontinuities in high-volume applications using wet method magnetic particle testing. Designed to mix with water, MG-450A improves indication visibility with less background fluorescence because of the high-strength, high-fluorescent MG-410 particles. These high performance particles combine with patent-pending water conditioner and corrosion inhibitor package to create a water bath that requires less maintenance, keeps performing longer and protects parts and equipment from rust. 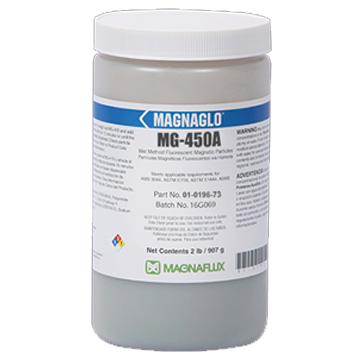 MG-450A is a great option for high-speed, high volume applications on raw products/materials, after secondary processing, on textured/rough surface finishes or on unmachined parts where indication visibility and through-put are important.